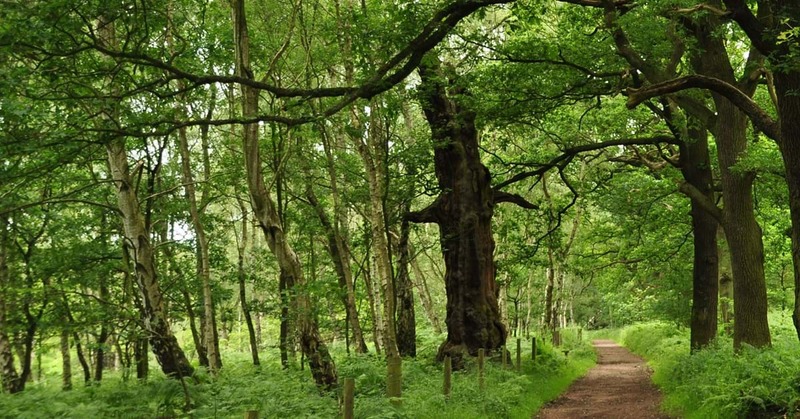 Today, Sherwood Forest National Nature Reserve encompasses 423.2 hectares, 1,045 acres (4.23 km2), surrounding the village of Edwinstowe, the site of Thoresby Hall. It is a remnant of an older, much larger, royal hunting forest, which derived its name from its status as the shire (or sher) wood of Nottinghamshire, which extended into several neighbouring counties (shires), bordered on the west along the River Erewash and the Forest of East Derbyshire. 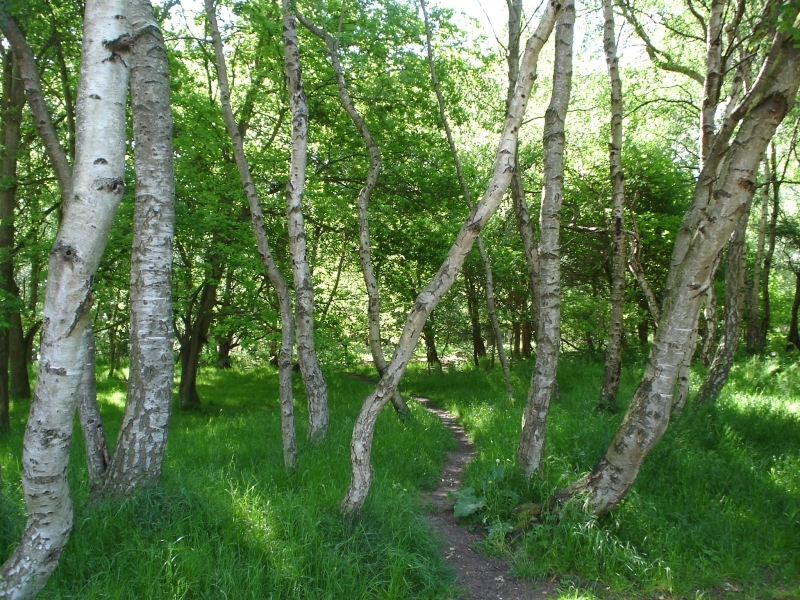 When the Domesday Book was compiled in 1086, the forest covered perhaps a quarter of Nottinghamshire in woodland and heath subject to the forest laws. Historically there were two different definitions of Sherwood. One was the great swath of woodland and heath found on the quickly draining poor sand-lands running up the centre of Nottinghamshire. The other was the Royal Forest of Sherwood, which comprised the royal manors and was subject to Forest Law. Before 1066 many of these manors were held by Edward the Confessor. Royal manors provided the King with his main power base so were very important. After the Norman invasion, these royal manors formed the core of the Royal Forest. The legal term ‘Forest’ meant an area subject to special laws designed to protect the valuable resources of timber and game (vert and venison). These laws were strictly and severely imposed by agisters, foresters, verderers (wardens) and rangers, who were all were employed by the Crown. It was Henry II who, in 1180, enclosed the Royal Hunting Park of Clipstone and made the manor at Kings Clipstone, which later became known as King John’s Palace, a royal residence. In the 1200s, popularly thought to be the time of Robin Hood, Sherwood covered about a fifth of Nottinghamshire. The main London to York road, the Great North Way, ran straight through Sherwood, and travellers were often at the mercy of robbers living outside of the law (outlaws). The 1630 map of Kings Clipstone shows the Forest to the east of Kings Clipstone reduced to rabbit warrens and scrubby heathland called the ‘Shrogges’, a local dialect word. Robin Hood is a legendary heroic outlaw originally depicted in English folklore and subsequently featured in literature and film. According to legend, he was a highly skilled archer and swordsman. In some versions of the legend he is depicted as being of noble birth, and having fought in the Crusades before returning to England to find his lands taken by the Sheriff. In other versions this is not the case and he is instead born into the yeoman class. Traditionally depicted dressed in Lincoln green, he is said to have robbed from the rich and given to the poor. Through retellings, additions, and variations a body of familiar characters associated with Robin Hood have been created. These include his lover, Maid Marian, his band of outlaws, the Merry Men, and his chief opponent, the Sheriff of Nottingham. The Sheriff is often depicted as assisting Prince John in usurping the rightful but absent King Richard, to whom Robin Hood remains loyal. A common theme of the story is that Robin is a champion of the common people fighting against injustice, whilst remaining loyal to the rightful ruler. He became a popular folk figure in the Late Middle Ages, and the earliest known ballads featuring him are from the 15th century. There have been numerous variations and adaptations of the story over the last six hundred years, and the story continues to be widely represented in literature, film and television. Robin Hood is considered one of the best known tales of English folklore. The historicity of Robin Hood is not conclusively proven and has been debated for centuries. There are numerous references to historical figures with similar names that have been proposed as possible evidence of his existence, some dating back to the late 13th century. At least eight plausible origins to the story have been mooted by historians and folklorists, including suggestions that "Robin Hood" was a stock alias used by outlaws in general who did not want to reveal their identity. The historicity of Robin Hood has been debated for centuries. A difficulty with any such historical research is that Robert was a very common given name in medieval England, and 'Robin' (or Robyn), was its very common diminutive, especially in the 13th century. The surname Hood (or Hude, Hode, etc.) was also fairly common because it referred either to a hooder, who was a maker of hoods, or alternatively to somebody who wore a hood as a head-covering. Unsurprisingly, therefore, medieval records mention a number of people called 'Robert Hood' or 'Robin Hood', some of whom are known to have fallen foul of the law. Bower writes: 'Then [c. 1266] arose the famous murderer, Robert Hood, as well as Little John, together with their accomplices from among the disinherited, whom the foolish populace are so inordinately fond of celebrating both in tragedies and comedies, and about whom they are delighted to hear the jesters and minstrels sing above all other ballads. Little John appears in the earliest recorded Robin Hood ballads and stories, and in the earliest references to Robin Hood by Andrew of Wyntoun in 1420 and by Walter Bower in 1440. The sobriquet "Little" is a form of irony, as he is usually depicted as a gigantic, seven-foot-tall warrior of the British forests, skilled with bow and quarterstaff. In the early tales, Little John is shown to be intelligent and highly capable. In "A Gest of Robyn Hode", he captures the sorrowful knight and, when Robin Hood decides to pay the knight's mortgage for him, accompanies him as a servant. In "Robin Hood's Death", he is the only one of the Merry Men that Robin takes with him. In the 15th-century ballad commonly called "Robin Hood and the Monk", Little John leaves in anger after a dispute with Robin. When Robin Hood is captured, it is Little John who plans his leader's rescue. In thanks, Robin offers Little John leadership of the band, but John refuses. Later depictions of Little John portray him as less cunning. The earliest ballads do not feature an origin story for this character. According to a 17th-century ballad, he was a giant of a man who was at least seven feet tall, and introduced when he tried to prevent Robin from crossing a narrow bridge, whereupon they fought with quarterstaves, and Robin was overcome. Despite having won the duel, John agreed to join his band and fight alongside him. From then on he was called Little John in whimsical reference to his size and in a play that reversed his first and last names (as his proper name was John Little). This scene is almost always re-enacted in film and television versions of the story. In some modern film versions, Little John loses the duel to Robin. Starting from the ballad tradition, Little John is commonly shown to be the only Merry Man present at Robin Hood's death. Despite a lack of historical evidence for his existence, Little John is reputed to be buried in a churchyard in the village of Hathersage, Derbyshire. A modern tombstone marks the supposed location of his grave, which lies under an old yew tree. This grave was owned by the Nailor (Naylor) family, and sometimes some variation of "Nailer" is given as John's surname. In other versions of the legends, his name is given as John Little, enhancing the irony of his nickname. According to local legend, Little John built himself a small cottage across the River Derwent from the family home. The site now has a 15th century Grade 2 listed ex-farmhouse and barn built on it, called Nether House at Offerton. The character entered the tradition through these folk plays, and he was originally partnered with Maid Marian: "She is a trul of trust, to serue a frier at his lust/a prycker a prauncer a terer of shetes/a wagger of ballockes when other men slepes." His appearance in "Robin Hood and the Sheriff" means that he was already part of the legend around the time when the earliest surviving copies of the Robin Hood ballads were being made. A friar with Robin's band in the historical period of Richard the Lion-Hearted would have been impossible because the period predates friars in England; however, the association of the Robin Hood with Richard I was not made until the 16th century; the early ballad A Gest of Robin Hood names his king as "Edward". What follows is a story which includes different versions of the legend. He was a former monk of Fountains Abbey (or in some cases, St Mary's Abbey in York, which is also the scene of some other Robin Hood tales) who was expelled by his order because of his lack of respect for authority. Because of this, and in spite of his taste for good food and wine, he became the chaplain of Robin's band. In Howard Pyle's The Merry Adventures of Robin Hood, he was specifically sought out as part of the tale of Alan-a-Dale: Robin has need of a priest who will marry Allan to his sweetheart in defiance of the Bishop of Hereford. The first appearance of Will Scarlet was in one of the oldest surviving Robin Hood ballads, A Gest of Robyn Hode. He helps capture Richard at the Lee and when Robin lends that knight money to pay off his debts, Scarlet stands laughing at little John for the cost of clothing the knight (Richard at the Lee} being nothing. ( Child Ballad 117A p,74) But after the knight has received four hundred pounds, 3 yards of every coloured cloth, a horse and saddle Will Scarlet insists the knight should have a pair of boots. ( Child Ballad 117A p,77). Another very early ballad featuring Will Scarlet is one variant of Robin Hood's Death, in which Will's only role is to urge a bodyguard, which Robin scorns. Maid Marian is never mentioned in any of the earliest extant ballads of Robin Hood. She appears to have originally been a character in May Games festivities (held during May and early June, most commonly around Whitsun) and is sometimes associated with the Queen or Lady of May or May Day. Jim Lees in The Quest for Robin Hood (p. 81) suggests that Maid Marian was originally a personification of the Virgin Mary. Francis J. Childe argues that she was originally portrayed as a trull associated with a lascivious Friar Tuck: "She is a trul of trust, to serue a frier at his lust/a prycker a prauncer a terer of shetes/a wagger of ballockes when other men slepes." Both a "Robin" and a "Marian" character were associated with May Day by the 15th century, but these figures were apparently part of separate traditions; the Marian of the May Games is likely derived from the French tradition of a shepherdess named Marion and her shepherd lover Robin, recorded in Adam de la Halle's Le Jeu de Robin et Marion, circa 1283. It isn't clear if there was an association of the early "outlaw" character of Robin Hood and the early "May Day" character Robin, but they did become identified, and associated with the "Marian" character, by the 16th century. Alexander Barclay, writing in c. 1500, refers to "some merry fytte of Maid Marian or else of Robin Hood". Marian remained associated with May Day celebrations even after the association of Robin Hood with May Day had again faded. The early Robin Hood is also given a "shepherdess" love interest, in Robin Hood's Birth, Breeding, Valor, and Marriage (Child Ballad 149), his sweetheart is "Clorinda the Queen of the Shepherdesses". Clorinda survives in some later stories as an alias of Marian. In an Elizabethan play, Anthony Munday identified Maid Marian with the historical Matilda, daughter of Robert Fitzwalter, who had to flee England because of an attempt to assassinate King John (legendarily attributed to King John's attempts to seduce Matilda). In later versions of Robin Hood, Maid Marian is commonly named as "Marian Fitzwalter." In Robin Hood and Maid Marian (Child Ballad 150), Maid Marian is "a bonny fine maid of a noble degree" said to excel both Helen and Jane Shore in beauty. Separated from her lover, she dresses as a page "and ranged the wood to find Robin Hood," who was himself disguised, so that the two begin to fight when they meet. As is often the case in these ballads, Robin Hood loses the fight to comical effect, and Marian only recognizes him when he asks for quarter. This ballad is in the "Earl of Huntington" tradition, a supposed "historical identity" of Robin Hood forwarded in the late 16th century. There are a number of excellent, if somewhat lengthy, walks through and around Sherwood Forest. Almost six miles long, this walk is classified as Easy, with an ascent of 250 feet. The walk should take about two and a half hours. 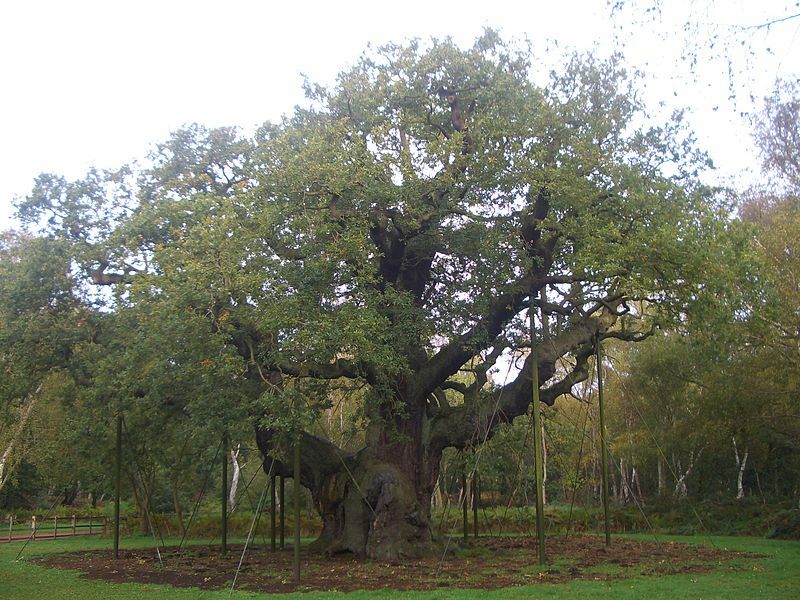 Sherwood Forest in the heart of Nottinghamshire is famous for its connection with the legends of Robin Hood. This walk explores some of the woodland including the ancient the Major Oak using a number of easy to follow tracks and paths. The start is the large pay and display car park (grid ref. SK626676) close to the visitor centre just off the B6034 on the north side of Edwinstowe, which lies on the A6075 between Ollerton and Mansfield. After parking follow the Greenwood Walk and then Clipstone Walk west for just over a mile to reach a broad open "avenue" running north to south (grid ref. SK606670). Turn left here and continue walking until you reach the A6075 (grid ref. SK606663). Turn right along the A6075 for about 250 metres and then right onto the Robin Hood's Way (grid ref. SK604662) following the green arrows, passing a memorial to reach a T-junction (grid ref. SK590666). Turn right staying on the Robin Hood's Way for a mile to reach a T-junction (grid ref. SK598661). Leave the Robin Hood's Way, first going left and then right. After 250 metres you reach a fork. Continue straight ahead here ignoring the right-hand path (grid ref. SK600683). After 600 metres you cross the Robin Hood's Way (grid ref. SK606685). After 200 metres take the right fork following a bridleway. After just over a kilometre you reach a junction (grid ref. SK616678). Go left here (do not fork right uphill) and keep straight ahead to the Major Oak (grid ref. SK620679) and continue back to the visitor centre and the car park. Enjoy a fascinating and enchanting walk among the age-old oaks of this legendary forest. The distance is 5.5 miles (8.8km) and the minimum time is about 2 hours 30 minutes. The ascent/gradient is 278ft (85m) and the level of difficulty is classified as Easy. The paths are easy woodland tracks and wide forest rides and the landscape is beautiful mixed woodland, more open to north. Suggested map aqua3 OS Explorer 270 Sherwood Forest with the start/finish SK 626676. Dog friendliness, on a lead around the visitors' centre, otherwise excellent. There is parking at Sherwood Forest Visitor Centre (pay-and-display) and public toilets at Sherwood Forest Visitor Centre. 1. Facing the main entrance to Sherwood Forest Visitor Centre from the car park, turn left and follow the well-signposted route to the Major Oak. 2. Go along the curving path as it completes a semi-circle around the impressive old tree and continue as far as the junction with a public bridleway (signposted). Turn left here and walk this straight and uncomplicated route for ¼ mile (400m), ignoring all paths off. 3. At a green notice board, warning of a nearby military training area, the main path bears left. Instead go straight ahead, past the metal bar gate, for a path that continues over a crossroads to become a wide, fenced track through pleasant open country of heather and bracken known as Budby South Forest. 4. At the very far side go through a gate and turn left on to an unmade lane, and walk this undulating route for ¾ mile (1.2km). 5. At the major junction just before the plantation begins, turn left, indicated 'Centre Tree'. With the rows of conifers on your right, and good views across Budby South Forest on your left, keep to this straight and obvious track. Where the track divides into two parallel trails, the gravelly track on the right is technically the cycle route, while the more leafy and grassy ride to the left is the bridleway, but either can be used. 6. When you reach the Centre Tree - a huge spreading oak - the two routes converge to continue past a bench down a wide avenue among the trees. Don't go down this but instead turn left and, ignoring paths off right and left, carry straight on along the main track back into the heart of the forest. 7. After almost ¾ mile (1.2km) you pass a metal bar gate on the right and then meet a bridleway coming in from the left. Ignoring the inviting path straight ahead (which returns to the Major Oak) bear right on the main track, past some bare holes and dips hollowed out by children's bikes. At a large junction of criss-crossing routes go straight on (signposted 'Fairground') so that an open field and distant housing becomes visible to your right. This wide sandy track descends to a field by Edwinstowe cricket ground. The Art and Craft Centre and youth hostel are on the far side, and the village centre beyond. 8. To return to the visitor centre and car park, follow the well-walked, signposted track back up past the cricket ground. On arrival in the welcome area, you’ll find all you need to fuel your day out. There’s lots to see and learn here, from the wonderful wildlife that makes its home in Sherwood Forest, to the legend of Robin Hood and his infamous gang of outlaws. Many visitors choose to go-it-alone and head off to see what they can find – but if you want some inspiration, pick up a trail guide – whether you’re inspired by the great oaks or on the hunt for Robin Hood, find the trail which best suits. Whichever you choose, there’s lots to find out about the wonderful wildlife, legends and oak trees which fill the forest. Families can also hire fun backpacks for their youngsters to help them enjoy a number of different activities, depending on the season. Speak to staff in the welcome area to get one. The Visitor Centre is the best place to start your journey. Brand new for summer 2018, the centre has been built by the RSPB and designed to provide a warm and welcoming gateway to Sherwood’s legendary landscape, and help to inspire the 350,000 annual visitors to enjoy and celebrate the forest’s rich and diverse woodland, wildlife and heritage. It’s home to the on-site café, where you’ll find freshly made produce, from sandwiches and jacket potatoes, to homemade pies, or children’s take-out picnic boxes for any young adventurers too eager to wait. There’s the Sherwood Shop with something for every budget – including pocket money shoppers – and gifts for all tastes and occasions. The place to pick up your Robin Hood and Sherwood mementos, as well as items from the RSPB range. And the toilet facilities are here too, with a Changing Places facility for users with disabilities, and their carers. Grab refreshments and head out to the amphitheatre whilst you plan your next move, or let the children explore the exciting Robin Hood play area before you begin your forest adventure. From here, Sherwood Forest is yours to explore… The visitor centre is open 10am – 5pm from March to October, and 10am – 4:30pm from November to the end of February. If you are interested in finding out about becoming an RSPB member, and helping protect and care for this special forest, you can ask any of the staff members around the site. Benefits include not just free parking at Sherwood, but more than 200 reserves around the country. There’s no end to the adventures waiting to be had, and every path will offer up a little magic…that’s why many visitors go their own way. But the trail guides have something suitable for all ages, abilities and interests, and are perfect if you want to leave less to chance. Don’t forget to pick up a printed guide in the visitor centre before you set off. And there’s always events going on! Time your visit to take in a seasonal guided tour or walk, learn some archery skills, or look out for the daily activities board on arrival, to see what the wardens are up to today. You can learn more about how the RSPB are working to manage and sustain the forest, and sometimes, there’ll be the chance to have-a-go yourself! Don't forget to check out the Robin Hood Festival, now in its 34th year! Each summer, this week long festival transports you back to the time of Robin Hood, with storytelling, medieval music and performances each day. You can also get involved in nature related activities organised by the RSPB, plus things like pony rides, archery, crafts, and check out scuffles between Robin and the Sheriff! Please check the listing for what is happening this year. The historic village of Edwinstowe is close at hand too, plus a craft centre just across the square from our visitor centre. Walk around the village and you’ll uncover dozens of places which also play a part in the story of Sherwood, such as the nearby St Mary’s Church, which famously lays claim to hosting Robin and Marian’s wedding. Sherwood Forest is an accessible environment for everyone, with wheelchair friendly trails and a fully accessible visitor centre. The visitor centre, shops and restaurants are all fully accessible for wheelchairs. A number of paths, such as the Major Oak path, are accessible to wheelchairs, but the oak is approximately half a mile from the visitor centre and there are some slight gradients along the way. As well as disabled toilets, they also have a large Changing Places facility at the visitor centre, which includes a hoist, shower, toilet and changing facilities for the comfort of their disabled users and their carers. Most standard disabled toilets are not big enough to cater for people who may need their carer’s assistance. This will be opening at the end of August 2018. Please keep dogs on lead around the visitor centre and under close control at all times. They need to be on leads in some areas of the forest to protect vulnerable wildlife such as ground-nesting birds, or where there are cattle grazing. Please look out for signs telling you where these areas are. At some park events (for example, bird-watching walks), dogs aren't allowed. If in doubt, please contact the visitor centre. The Sherwood Arrow service runs hourly from Victoria bus station in Nottingham and stops outside the new visitor centre. The direct journey takes around an hour. For up to date information check here www.bustimes.org.. The nearest train stations are at Shirebrook (6 miles) Mansfield Woodhouse (6.5 miles) and Mansfield (7 miles). These are all served by the Robin Hood line, operated by East Midlands Trains and you can find timetables here www.eastmidlandstrains.co.uk. You’ll find ample parking available at Sherwood in the main car park, just across the road from the visitor centre. The car park is accessed via the entrance on the B6034, and it’s open from 10am – 5pm in summer and 10am – 4.30pm in winter. Park up and follow the signs across the road and on to Forest Corner, where you’ll catch your first glimpse of the visitor centre through the trees. Parking costs £4 for non-members, and is chargeable for anything up to a full day, and is free for RSPB members. Being an RSPB member also allows you free parking and entry to 170 other reserves across the country, as well as supporting their vital work to give nature a home. Accessible parking for any visitors with disabilities is available adjacent to the new centre. Transport: Mansfield (7 miles) OR Nottingham (both National Rail) then bus;. Bus routes: Stagecoach 'The Sherwood Arrow' stops at the visitor centre. Opening Times Visitor Centre: Daily, 10:00 to 17:00, March to October; 10:00 to 16:30, November to February.